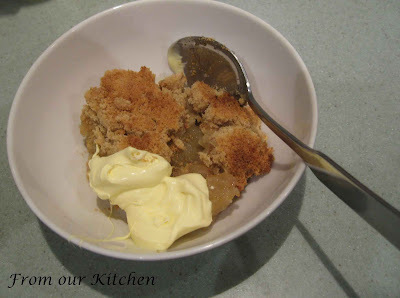 We used the apples we bought at the market today to make apple crumple for dessert. We found the recipe on the Best Recipes website. It was simple, easy to follow and quick to put together. This dessert is delicious served with ice-cream or double cream. You can also add sultanas to the apples. I modified the recipe slightly to suit our tastes. Place apples, cloves, water, cinnamon stick and brown sugar into a saucepan. Simmer on low heat for about 15 minutes or until apples are soft. Place the butter, sugar and flour into a mixing bowl. Using finger tips, rub the butter into the sugar and flour until resemble breadcrumbs. Place crumbs into the freezer until apples are cooked. Place the cooked apples into a baking dish and sprinkle crumbs evenly over the apples. Bake in the oven for 30 minutes or until golden brown. Serve warm with vanilla ice-cream or dollop of double cream or custard. hmmm....i've a bag of Golden Delicious and was just thinking of making an apple pie. yours looks good! Tania: look forward to your post.